Cat6a Patch Cables There are 66 products. This exclusive range of small diameter Cat6a snagless patch cables is a perfect choice for (10Gigabit) high density patching. 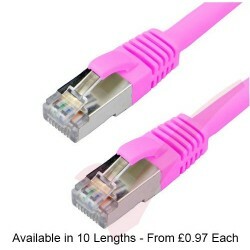 It’s slim 4.5mm 30AWG cable thickness is 30-40% smaller than our standard Cat6a patch cables, this in turn reduces the amount of valuable rack space and need for extra cable management. This Category6a (10 Gigabit) Shielded (SSTP) UL Certified 100% copper patch cable has a LSZH outer sheath (jacket) and twisted stranded cores providing a highly flexible cable for a wide variety of RJ45 installations. It's High Density Snagless Boot with Strain Relief makes it an ideal cable for quality patching by protecting/covering the latch. Category6a UL Certified 100% copper patch Cable has a LSZH outer sheath (jacket) and Shielded Screened/Foil twisted pair stranded cores providing a highly flexible cable for a wide variety of RJ45 installations. It's snagless bubble boot with strain relief makes it an ideal cable for high density patching by protecting/covering the latch in critical network core environments. 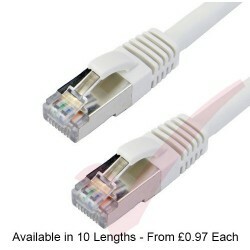 Patchsee intelligent Cat6a patch leads available as UTP/PVC and FTP/LSZH variants as both straight through and cross over connections. The slim line boot is ideal for high density patching environments and the easy to install range of coloured Patch See Clips allow for first level identification. These 26AWG short 20cm Category6a UL Certified 100% copper patch cables have a LSZH outer sheath (jacket) and 8 coloured twisted stranded cores. 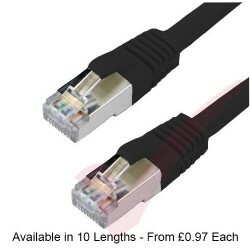 Supplied in packs of 24 for easy 2U short length Switch to patch panel 'patching' across any RJ45 installation. Its flush style boot makes it an ideal choice for high density and accurate patching, resulting in a significant cable management improvement and no need for additional expense installing extra cable management products. Cat6a - our most cost effective 10 Gigabit Patch Cable range. 11x different stocked lengths in up to 10x colours. Cat6a Certified and available for immediate next day delivery. Quality shielded S-FTP with Low Smoke Zero Halogen Jacket. Snagless Bubble Booted - ideal for patching at the network Core.